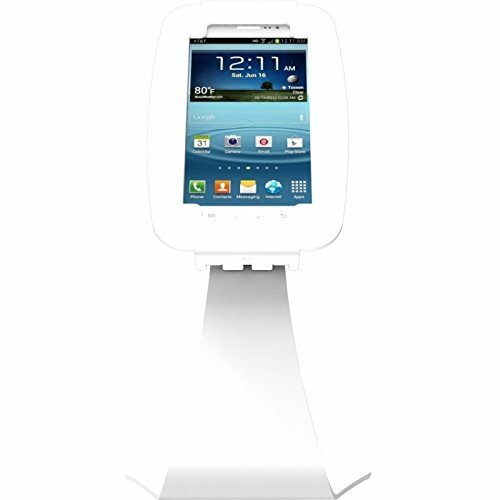 Marketing Information: Swan Galaxy Enclosure Kiosk - Fits Galaxy Tab 3 7.0 and 8.0| Marketing Information: The Galaxy Swan Kiosk for Galaxy Tab 3 7.0 and 8.0 is the newest release from GalaxyEnclosures. Elegantly designed with a white swan-neck sloping stand your new Galaxy Kiosk bring a level of class to any setting. Marketing Information: The Galaxy stand is angled at 60 degrees for optimal viewing and sits 14 inches (35cm) high and at the base is 7 inches (18cm) wide. The enclosure rotates 90 degrees for smooth transition between landscape and portrait mode.